In the first quarter of 1984 there were 14,400 commercial banks in the U.S. As of the first quarter this year, the number had dropped to only 5,693. During the course of about 30 years, the number of banks in the U.S. hence declined by 8,707 or 60.5%. 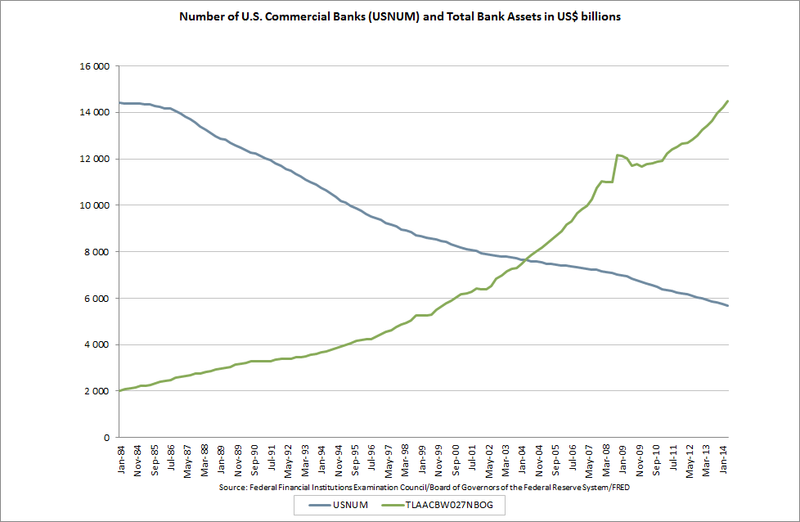 During the same period, total assets for all U.S. commercial banks increased from USD 2.0259 trillion to USD 14.4846 trillion, an increase of 615.0%. As a result, total assets for the average bank increased from USD 0.14 billion to 2.54 billion, or 1,708.5%, during the 1984 to Q1 2014 period. This is by no means a development that is losing pace. Since the onset of the U.S. banking crisis (Q2 2008 used here), the number of banks have decreased by 1,444 (20.2%) while total assets have increased by 31.7%, leaving the average bank with 65.1% more assets today than just six years ago. For those truly believing that a bank can be too big too fail, there is substantially more to worry about today than six years ago. There are obviously many good reasons why the banking industry in the U.S. has consolidated during the last 30 years (as is the case for many other industries) such as economies of scale, expanding the range of products/services, synergies, bankruptcies etc. But there is another fundamental and powerful reason banks merge and make acquisitions. This reason is directly related to fractional reserve banking which lies at the heart of the U.S. monetary system. Simply put, a commercial bank attempts to make a profit through issuing loans, accepting deposits and through providing a range of financial services. As such, the extent to which it can create loans (credit) is an important factor deciding the level of profits. Many banks will therefore normally seek opportunities that expand their loan portfolios (ceteris paribus) in order to increase profits. k: the proportion of loans granted which, on average, remain unused by borrowers at any given time. The fewer the banks operating in the market, the higherÂ kÂ will be; the higherÂ kÂ is, the less money will leave the bank; the less money leaves the bank, the greater the bankâ€™s capacity for expanding loans. One of the strongest motivations behind the trend toward bank mergers and acquisitions which has always been obvious in fractional-reserve banking systems is precisely the desire to increaseÂ k. In fact, the more banks merge and the larger their subsequent market share, the greater the possibility that the citizens who receive the banksâ€™ fiduciary media will be their own customers. Therefore bothÂ kÂ and the corresponding capacity to create loans and deposits from nothing will be increased and the resulting profit much greater. The value ofÂ kÂ is also increased when monetary deposits are made in other banks, which in turn expand their loans, and their borrowers ultimately deposit in the original bank a significant portion of the new money they receive. This phenomenon also causes an increase in the bankâ€™s monetary reserves and therefore in its capacity for credit expansion. In conclusion, the desire to increase loans and deposits through increasingÂ kÂ has been a strong motivation for banks to merge and grow through acquisitions. Two banks that have merged are able to expand their loan portfolio and deposits by a larger multiple than the two combined as stand alone entities. And as long as the current fractional reserve banking system survives, bank mergers and acquisitions will continue unabated in the future as any “prudent” bank would seek to increaseÂ kÂ in order to increase profits. In theory, this could continue until there is only one bank left standing. Regulation is perhaps the only way to end it (other than unreasonably high stock prices of target banks) as long as we have a fractional reserve banking system. Finally, as theÂ kÂ in the above formula has increased substantially over the years, banks’ fire power to expand credit has increased with it. Though the increase inÂ kÂ by itself perhaps makes banks less prone to bank runs, their ability to create ever more fiat money only increases the potential, and probability, for creating yet bigger and even more violent credit cycles than those in the past.